First things first :) Don't have BeLive account on Facebook yet? Check out this article to get one! Ready to go? Let's move forward to creating your Talk Show broadcast! 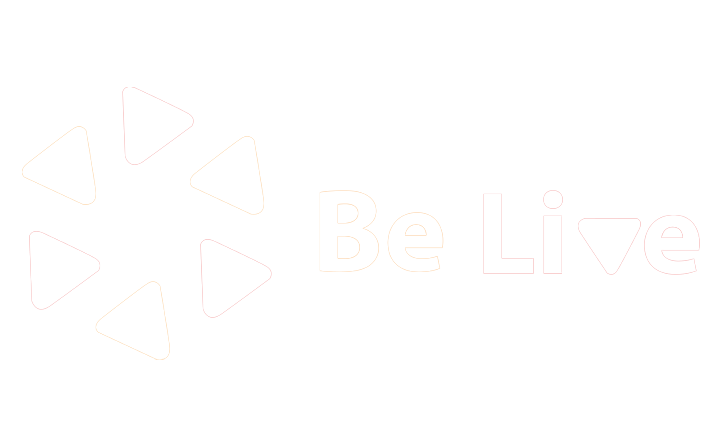 Please, go to belive.tv and click on "Start Broadcasting" button in the middle of the screen. 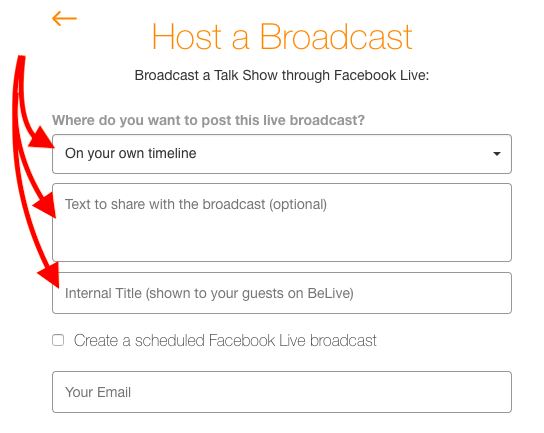 You will see different broadcast formats, this time we will choose Facebook Talk Show! date and time for your scheduled broadcast as well as the image to the announcement post. Moreover, you can add your branding! 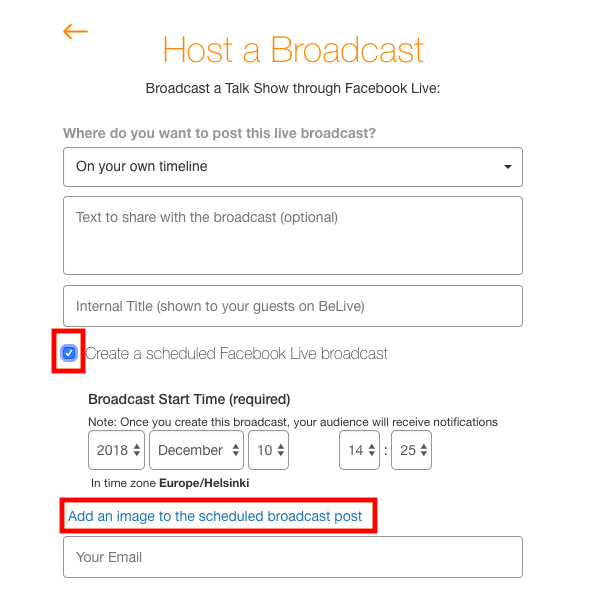 Feel free to leave email field empty if you want to receive a link to the broadcast on the same email that is connected to your FB account. Otherwise, type in the needed email. Once done, press "Create Broadcast" button. Hey, now you're in the Production Studio! Let's have a closer look at the features that Talk Show broadcast offers you. In Talk Show, you can have up to 4 people on the screen (Broadcast section) and 10 more people in the Lobby section waiting for their turn to join the broadcast. 1. The backend chat is created for internal communication with your guests, click on Chat icon in the left-bottom corner of the screen. 2. By clicking on "Copy Link" button, you will get the guest link to share with your interviewees. No worries if you don't see it, it's still there, just paste it to the message for your guest! You can also upload photos from your Facebook albums, share the screen (available within the Standard plan), and add a poll (after going live). 3. The preview window shows how the broadcast will look like for your viewers. 4. It's possible to change the Layouts, choose the one that fits your needs under the preview window. 5. In case you missed a short tutorial which walks you through all Talk Show features when you are creating your very first Talk Show, you can replay it any time you want by clicking three dots in the top-right corner above the preview window ("Replay Tutorial"). 6. Have a list of topics to be discussed during the livestream? Keep the stored in the Agenda. 7. 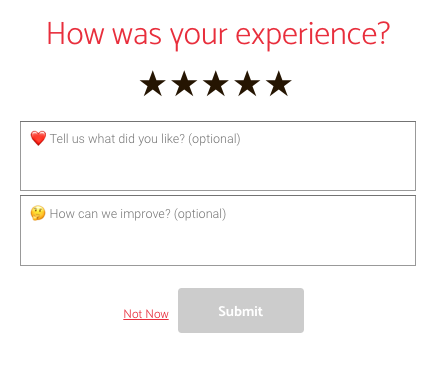 Type on any text and show it on the screen as a static update or click to select Crawler and use a ticker bar format to engage with your audience! 8. All the live comments from the original post on Facebook will be displayed under the Live Comments section. You can answer to the comments right from the studio if you are broadcasting to your business page. 9. Should you have any questions, you can always contact us by pressing the Chat icon in the right-bottom corner of the screen. Note, that it will dissappear once you go live in order not to disturb you! 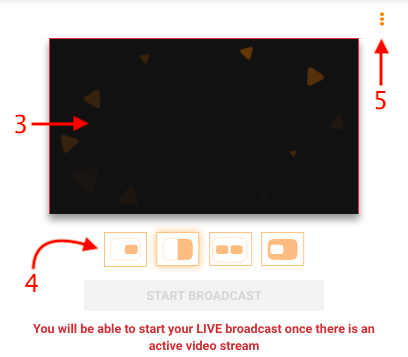 Keep in mind, you won't be able to start your broadcast if you don't have an active video stream. For that click on "Connect camera" button in the bottom left corner of the Lobby Section and move it to the Broadcast Section by clicking "To broadcast" button. 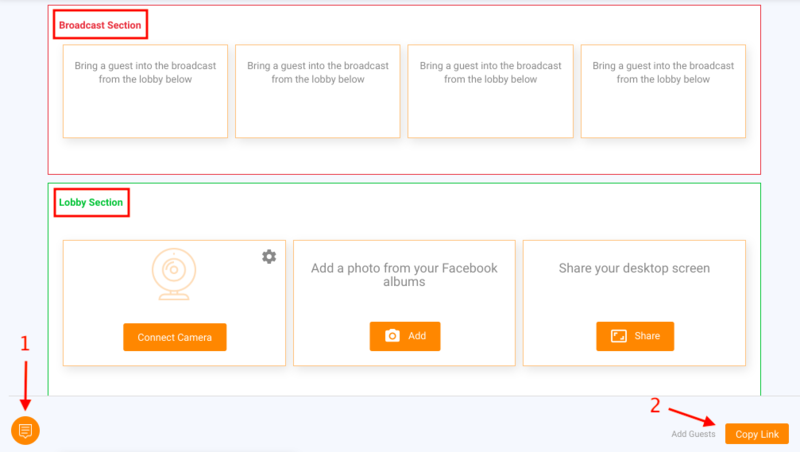 You will know that your camera is connected properly if you see yourself both in the window in Broadcast Section and the preview window on the right. Also, you can edit your or your guest's name and show it on the screen. 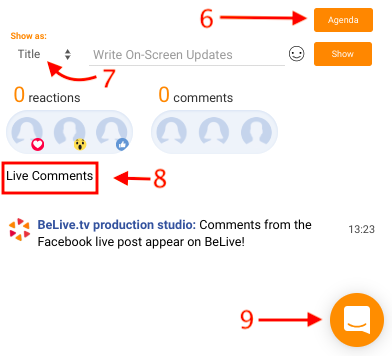 By default BeLive will show Facebook name, to change it just click on it when the name is not displayed on the broadcast as shown below. Use a Mute button to mute any of the windows in the broadcast studio and a Solo button to show only certain window on the broadcast (on the right you can see how active Solo button looks like). And, finally, use red arrow to drop the screen back to the lobby. Once you're ready to go live, click "Start broadcast" button and then "Start Live broadcast." And you are live! To end broadcast press "End broadcast" button on the right under the preview window and then click "End live broadcast". Make sure you ended your broadcast. Otherwise, it will be still streaming until Facebook stops it. As you've probably heard, Facebook changed the rules of the game, and due to these restrictions, we cannot access names and profile pictures of the viewers who comment, as well as their reactions to your broadcast when broadcasting to a group. Good news - we do have a workaround! Check out how to make your viewers interacting on your broadcast! Tired of reading? :) Check our video tutorial on how to create a Talk Show!